To get an accurate estimation on the amount of flooring you need to buy to cover your space, you must first properly measure a room to determine how much flooring space is needed. 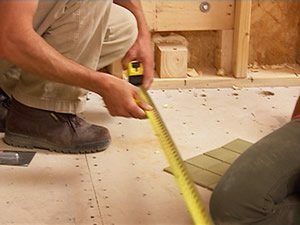 Flooring is most often sold by the square foot, thus square footage is what will be used to find the actual measurement of the area to be covered by new flooring. Now you must also factor in waste flooring. This is the amount material that will either be cut away, around or be unused when the flooring is actually laid. Depending on the type of flooring and installation process and the objects impeding your floor, a waste factor of 5% – 15% must be added to the amount of square footage of any flooring estimate to allow for cutting waste. Example: a 10′ x 20′ room = 200 sq. ft. Using a waste factor of 10% we calculate 10% of 200 is 20 so you will have to purchase 220 sq. ft. in order to have enough flooring to cover the entire floor. Now factor in that the product you selected has 17.44 square feet per carton. Divide your square footage need, 220 by 17.44. A result of 12.61. You would need to purchase 12 or 13 cartons of the flooring choice, depending on the complexity of the room and your installer’s experience, to be able to cover the entire space. Cutting waste also allows for some minor defects, if any, in the flooring to be cut out or eliminated. If you are doing a project that involves several rooms which includes a lot of cutting you should calculate 10-15% more for additional flooring material. This will allow for less waste in one large room opposed to several smaller rooms. Please review the Diagram provided below to properly measure square footage for the new floor you wish to install. When measuring for square footage: Simply multiply the Length x Width of any room. This equals your square footage. (Length x Width = sq. ft) Example: 10 x20 = 200 sq. feet. Add an additional 5 -15% for waste. The type of flooring, its install process and the placement of walls and other permanent obstacles in your home will determine how much overage you will need. Better to err on the side of caution and buy more. With more you also have leeway for mistakes. Remember to take measurements for length x width of every room separately.